The cause of tooth stains is not always the result of colored foods and beverages. Special populations suffer from stains caused by medication, fluoride, tobacco, aging, or trauma to the tooth. Depending on the severity of the stain and its type these special populations may not benefit greatly from teeth whitening. They will of course benefit to some degree however prior to using tooth whitening it's important you have realistic expectations and consider consulting with your dentist prior to use. If you have one tooth that is darker than the rest it is either the result of trauma to the tooth or the effect of a medication. If the cause of the single dark tooth is from trauma it means either: 1) iron from your blood saturated the dentin of the tooth which resulted in deep internal staining or 2) the trauma caused an uneven surface of the tooth enabling the single tooth to collect stains at a faster rate than the other teeth. Read the article Single Dark Tooth for an in-depth explanation of the cause and available solutions. 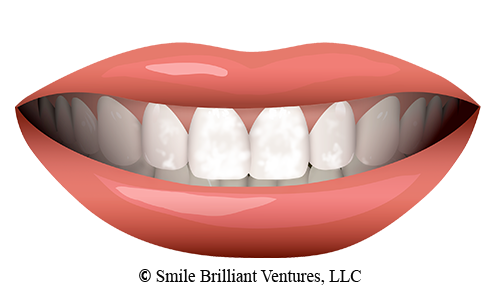 When you look closely in the mirror do you notice white spots scattered on your teeth or perhaps only 1 white spot? White spots on your teeth are usually the earliest sign of carious lesion (cavity formation). Don't worry, this does not mean you need to rush to the dentist but you should be sure to continue with your 6 month checkups and cleaning so your dentist can keep an eye on it. Essentially what is happening is the tooth is losing calcium in a process termed decalcification. Decalcification is usually caused by a combination of diet and low saliva production. It cannot be reversed; however it can be managed through hydration and remineralization using product containing fluoride such as Smile Brilliants desensitizing gel. Read the article White Spots on Teeth: Decalcification for more information on decalcification available solutions. Granted this is not a type of stain it seems fitting for the discussion since a frequently asked question is "will teeth whitening whiten veneers, caps, crowns, etc.?" 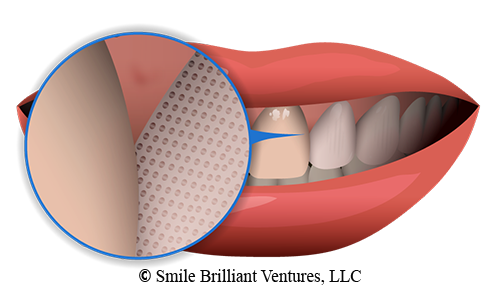 The surface of dental restorations are smooth like glass and do not have pores in it like the tooth. Because the surface and smooth and without pores staining substances cannot latch on and stain the dental restoration which means your restoration does not have stains to remove. If you did not have your teeth whitened prior to having the restoration installed it is likely the natural color of your teeth differ from the natural color of your dental restoration. For more information on whitening dental work read the article "Will teeth whitening whiten dental work? In short NO." Tetracycline's are a group of varying antibiotics used to treat common bacterial infections. If tetracycline is taken by the mother during pregnancy from the second trimester onward or if the child takes tetracycline from birth through age 12 it can cause tooth staining. The severity of stain varies based on the age of the individual and the period of time they were exposed to tetracycline. Research is inconclusive as to whether or not teeth whitening can remove tetracycline stains. Most dental professionals agree that everyone can benefit to some degree however it is very difficult to fully mask/remove all of the tetracycline stain. It's recommended to consult with your dentist for a professional opinion. 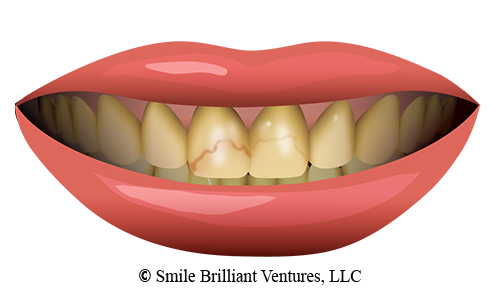 For more information on the subject of tetracycline stains and available treatments read the article "Tetracycline Stains"
Tooth staining is just one of the countless side effects caused by tobacco use. The staining is caused by both the nicotine and tar. Nicotine is colorless however when mixed with oxygen it turns yellow which of course latches on to and within the tooth after repeated use. Even if the nicotine and tar do not latch on to the tooth your entire mouth is lined with it. Saliva flow keeps it in constant contact with the tooth making it impossible to avoid tobacco induced stains on the tooth. 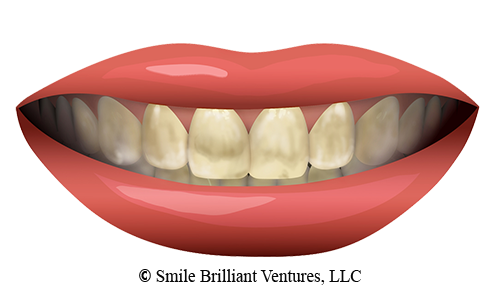 Fortunately with repeated use of teeth whitening tobacco stains can be removed and managed. If you would like a more in depth explanation and solution read the article "Tobacco Stains On Teeth: The cause and available solution"
Granted fluoride is said to promote tooth health, too much of it can create less than attractive and very stubborn stains on the tooth. Roughly 22% of the population has dental fluorosis to some degree; however for the majority the fluoride stains are very mild. Because our water supply is laced with fluoride with the concentration ratio is on the rise so are the number of reported cases of those suffering from dental fluorosis. In 1987 22% of the child population was reported by dentist to have fluorosis. Back in 2002 that number increased by nearly double to 40%. For a more information on dental fluorosis read the article "dental fluorosis" where you will also find treatment options as well.